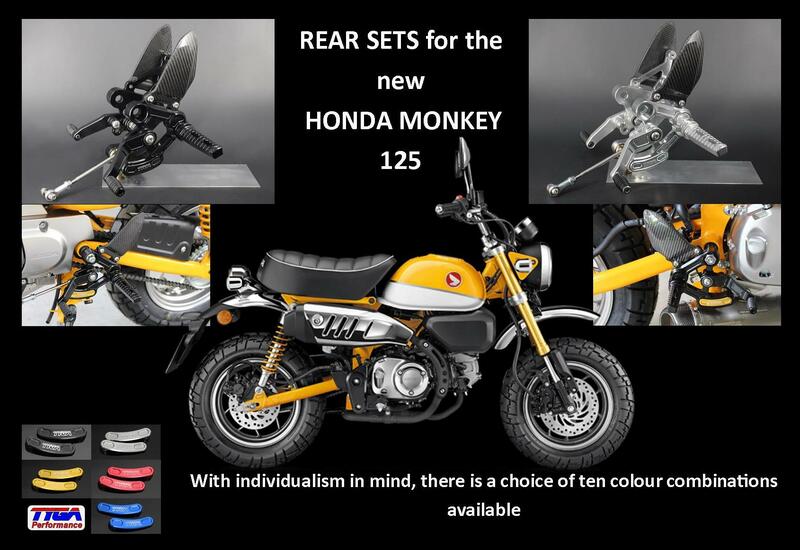 Honda launched the global model Monkey 125 earlier this year and naturally, we at TYGA were keen to get our hands on the latest and greatest diminutive Honda . The Grom, from which a lot of the mechanical parts of the Monkey are borrowed, is a really fun bike to ride despite its small size and the Monkey promised to be more fun with its retro styling and more quality with its no expense spared build quality and price to match. So we quickly ordered our mini bike and within a few days a bright yellow and very shiny Monkey was sitting in our factory. After a few jaunts down the local roads, we focused our attention on What we could offer s to compliment this already very well turned out machine so owners could individualize their ride to their own liking. We quickly established what would and what would not fit from our existing product range and found out that with a different swing arm shaft, the Grom TYGA rear sets are a direct bolt on. Not only that, but the position is comfortable and natural and the rear sets are both unobtrusive as well as intricate in detail and don’t detract from the theme of the bike in general. For example, the rear brake master cylinder is discretely hidden behind the carbon heel guard and not left hanging out the back which is where it would normally want to be. The rear sets are available in clear (silver) and black anodized finish and have a range of slot colours to choose from making for a total of 10 combinations. As well as the rear sets, we also have a few CNC machined parts ready to go. These include multi adjustable flip up brake and clutch levers, triple clamp bolt, and handlebar clamp. We then looked at the most obvious component to change; the exhaust. Honda needed to pass Euro 5 emissions so understandably their exhaust is pretty quiet and no doubt clean, but it is also hideous to look at and astoundingly heavy for such a small bike to be burdened with. Luckily, we already have a low level performance exhaust system that fits straight on. We have two versions of the low mount, one with a short silencer and another with a long type. The only issue then is that there is a big ‘gone’ where the exhaust was once located under the seat, and the Monkey is crying out for another side panel. Luckily, we have the technology (well access to it). The left side panel was sent off to Bangkok to be 3D scanned and with the resulting file we could then flip it and 3D print it. From this we made a mold, some mounting stays and carbon side panels to match the left side. We naturally then used this as an excuse to make a left side panel in carbon too so the two sides now match perfectly. From experience and owner feedback, we knew that you can never have too much choice as a motorcycle owner, so we set about designing a version of our exhaust that runs along the same route as the stock one but much slimmer and more free flowing. The Maggot design seems to work on most bikes new or old and true to form it suited the Monkey too. This system not only gives more power than stock, it also is surprisingly quiet with its dB killer installed. Before signing the Maggot system off for production, we looked at the stock Honda exhaust and figured that in the interests of recycling, saving the planet and keeping costs down, we could install the quality stock Honda exhaust guard on our Maggot system and we have therefore provided removable stays for using this exhaust as shown in the photos. That said, it is not essential to have an exhaust guard installed at all, this being more an aesthetic decision because the exhaust is far away from the riders leg and shouldn’t cause any discomfort or burns in normal operation. Thus, TYGA exhaust choice number 3 was born. Three exhaust options is good but 5 is better. In the pursuit of more choice, we also offer two oval silencer versions for the high level exhaust, one is with a carbon sleeve and the other with a stainless one. If you include with or without under cowl with the low mounts and with or without the exhaust guard, I make that 8 exhaust configurations. Time to move on to other products! As you may have noticed, there are quite a few other parts besides the side covers which have been given the carbon treatment on our Monkey. These range from the air box covers, to the sprocket covers to the fenders. The rear fender was supplied with a huge registration/license plate holder and this was really quite monstrous to look at and was not designed with lack of weight in mind. By substituting carbon fenders and using our tail tidy instead of the stock one, more weight savings can be had. The tail tidy can either be used with the stock chrome rear fender or our carbon one. What can’t be used is the stock registration/license plate holder hanging off our lightweight carbon rear fender, but then why would you? This project Monkey is a work in process and we have more products planned in the future such as upgraded brakes. We are also really looking for feedback and ideas from owners so don’t be shy in coming forward. For now, what we have tried to do is make an already unusual Honda unique and while at the same time improved its performance and reduced its weight. Watch this space for Monkey, Part 2.